You can enter in Forbidden City only from south, through the Meridian Gate. This 35 meters high gate is also known as Five-Phoenix Tower, since it resembles a phoenix with five pavilion buildings. Because of the belief that meridian line goes exactly through the Forbidden City, it got its official name. Throughout the history, it served for many important purposes. It was the place where condemned officials were executed, and the place where the lunar calendar would be issued the first day of the tenth month every year. After you pass through the Meridian Gate don’t go straight, but allow yourself to explore wings of central complex and enjoy in ancient paintings and pottery. On left (west) side from Meridian Gate is the Gate of Prosperous Harmony that will take you to the Hall of Martial Valor(武英殿; Wuying Dian), which now houses Painting Gallery. After you finish with Painting Gallery go east from central complex (opposite of the Gate of Prosperous Harmony), through the Gate of Unified Harmony and you will reach the Hall of Literary Glory (文华殿; Wén Huá Diàn) and Pottery Gallery. The Hall of Martial Valor is also known as the Hall of Literary Flowers, and it is set in the outer court of the Forbidden City. In the past, it served for military purposes, and the emperor even lived and worked in it. From the half of the 17th century, it was turned into a book store, where the exquisite books were published. Unfortunately, the fire that occurred in 1869 destroyed all the books, though the hall was reconstructed the same year. Today it is turned into the Painting Gallery, with beautiful ancient and rare Chinese paintings. The Hall of Literary Glory is also in the outer part of the Forbidden City and dates from the early Ming Dynasty. However, today’s hall is not the original one, since it was ruined at the end of their rule, so it was rebuilt during the reign of the Qing Dynasty. It was used for various purposes throughout the history, but the most important are the famous reading ceremonies of the emperor. Today it serves as the Pottery Gallery of the Forbidden City. The Pottery Gallery has more than 400 pieces of pottery treasures, with all the pieces that testify the development of the pottery in China. When finished with these two halls, you should go back to Central Complex and continue across the Inner Golden Water Bridges. There are five bridges with a very nice decoration, made of marble, though they were wooden in the past. After inner bridges, go through the Gate of Supreme Harmony (太和门; Tài Hé Mén), which is the main gate of the Outer Court. At the gate, there are two bronze guardian lions, and it is very symbolic since they represent imperial power. After the gate, you come to the core of Forbidden City, encountering three great halls: Hall of Supreme Harmony, Hall of Central Harmony and Hall of Preserving Harmony. Continuing further, you will come across the Hall of Central Harmony (中和殿; Zhōng Hé Diàn), the smallest out of the three halls. It was built in 1420, covers an area of just 580 square meters, and it is 29 meters high. After it was built, it was destroyed in a great fire and was renamed into Zhong He Dian. It usually served to emperors to have a rest and prepare for the ceremonies they held in the previous hall. The inside of it is very interesting, with an amazingly shaped throne, and two unicorns on each side of it. Besides, there are also two sedan chairs that served to the emperors to move around the Forbidden City. The last one, out of the three main halls, which altogether have the name the Three Great Halls of the Outer Court, is the Hall of Preserving Harmony (保和殿; Bǎo Hé Diàn). It is the second when it comes to its size, bigger than Central, but smaller than Supreme, and it was built in 1420. Of course, it also had its reconstruction periods, one in 1625 and the other in 1765. Its main purpose during the Qing dynasty was to hold imperial banquets and similar events for the entertainment. It also serves for the celebration of the New Year’s Eve. Dragons and huge stone carvings are its main feature, with interesting shapes. Further north from Hall of Preserving Harmony are Qianqing Men Square and Gate of Heavenly Purity (乾清门; Qiǎn Qīng Mén). The Gate of Heavenly Purity is the main gate that divides Forbidden City into two parts, the Inner and the Outer Court. Build in 1420, and reconstructed in 1655, it is also known by the name of Qian Qing Men. Here you may see bronze lions, though this area is full of them. The gate is 16 meters tall, and besides the lions, it also has golden vats, which are estimated to have 2,000 kilograms of weight. Besides their decorative purpose, they also can hold the water if it comes to fires. When you cross the gate, make a small detour on the left (western) side and visit the Hall of Mental Cultivation (养心殿; Yǎng Xīn Diàn). The Hall of Mental Cultivation was built during the reign of the Ming Dynasty, actually during the period of Emperor Jiajing (1522 – 1566), but it was not of a particular importance at the time. Later it became the palace where the emperors lived, and it is how it significance became bigger. It also has the name the Hall of Three Rare Treasures, because of the emperor Yongzheng, and the fact that he had the rare calligraphy masterpieces by the three Wang’s. The throne and the space around it dominates with blue and yellow color, being somewhat different from other, but not surprising, since the yellow is very important color in royal family. After visiting the Hall of Mental Cultivation go back to the central corridor and continue to the north, where you will pass through the Palace of Heavenly Purity (乾清宫; Qiǎn Qīng Gōng), Hall of Union (交泰殿; Jiāo Tài Diàn), and Palace of Earthly Tranquility (坤宁宫; Kūn Níng Gōng). When you go through the Gate of Earthly Tranquility (坤宁门; Kūn Níng Mén) you will come across the Imperial Garden (御花园; Yù Huā Yuán). This garden was also constructed during the Ming dynasty in 1417, and it covers an area of around 12,000 m2. It is quite interesting, with its rectangular shape, and its importance for the imperial family was also crucial since it served to them as a private retreat. This is the place where more than twenty structures that are man-made perfectly function with all of the natural goods, such as flowerbeds or trees. Each corner of the garden has a pavilion, and those four pavilions are the representation of the four seasons. This is the perfect place to rest and prepare for the next destinations within the Forbidden City. When you finish with garden, enter the complex of Six Eastern Palaces (东六宫; Dōng Liù Gōng) and go through it from north to south direction, up to Qianqing Men Square. From the Qianqing Men Square go through the Gate of Great Fortune which will lead you to the Hall of Ancestry Worship (奉先殿; Fèng Xiān Diàn) and magnificent Clock and Watch Gallery. The Hall of Ancestry Worship is the main hall inside the Imperial Ancestral Temple. It was constructed during the reign of Ming dynasty but rebuilt in 1657. However, this is not the look from that period, since it was restored many times since then. It is one of only four buildings to stand on a three-tiered platform, which is a portrayal of its sacred importance. 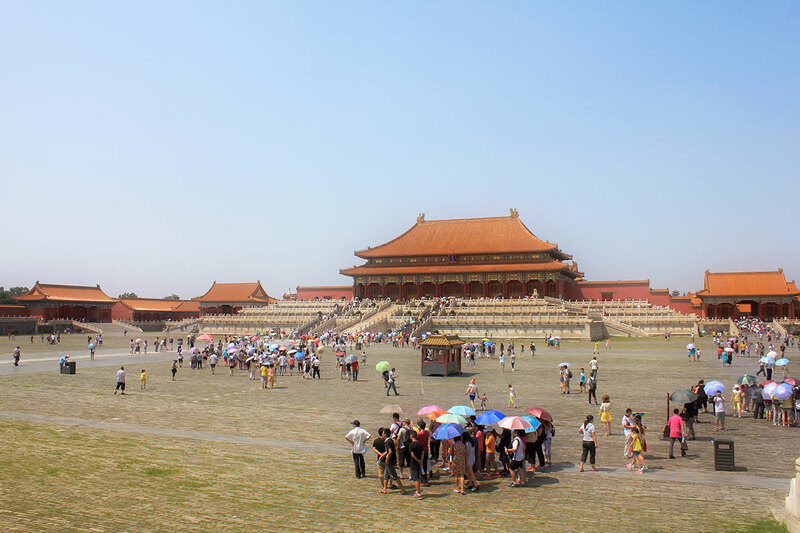 Its historical importance is enormous as well since it served as the place where the imperial household worshiped their ancestors in the Ming and Qing dynasties. It served for many different purposes, and whenever some important days occurred, such as birthdays or death anniversaries of the ancestors, grand ceremonies would be offered here. Clock and Watch Gallery are also worth visiting, and though the additional ticket of CNY10 should be paid, this is something not to be missed in any case. This is one of the many exhibition places in the Forbidden City, and it has more than two hundred clocks and watches, of different origins, from England, France, Japan, and of course, some domestic ones. The biggest attraction is definitely one 5.85 meters high clock, dating from the Qing dynasty, which today works regularly after being wound. This is an exquisite collection of imperial clocks and watches, and everyone interested will be amazed by these brilliant pieces. After Hall for Ancestry Worship, further, to the east you will come across to the interesting Nine Dragon Screen (九龙壁; Jiǔlóngbì) and entrance to the Palace of Tranquil Longevity (宁寿宫; Níng Shòu Gōng). Nine Dragon Screen is a beautiful art masterpiece, which is relatively young, considering the fact it was built by the end of the 18th century. This colorful attraction is one of the most appealing for taking pictures. It is located east of the Hall of Preserving Harmony, and it was built to block the view from the Gate of Imperial Supremacy, providing privacy for the imperial family. North of this wall, you may see the Palace of Tranquil Longevity, one of the four palaces in the complex of buildings for the emperors who abdicated the throne. It is the part of the Inner court, and it was built in 1689. It resembles the style of the Palace of Earthly Tranquility, and it is the central axis of the Forbidden City. Shaman deities were respected here and abdicated kings would use the palace to worship God. When going north through the Palace of Tranquil Longevity you will pass by the Treasure Gallery (珍宝馆; Zhēn Bǎo Guǎn) and in order to visit it, you need to pay additional CNY10. It basically consists of the three halls, the Hall of Spiritual Cultivation, the Hall of Joyful Longevity, and the Belvedere of Well-Nourished Harmony. These three halls house many fascinating examples of the treasure, dating from Qing dynasty, including pearls, crowns, jade, and other silver and gold products of enormous value. After this, on the east of the Hall of Spiritual Cultivation, there is the Pavilion of Pleasant Sounds, and it is the biggest theater in the Forbidden City. It dates from the Qing Dynasty, and its construction started by the end of the 18th century. It lasted until 1891, and today’s look dates from the period of the reign of Jiaqing. It has three floors, 20.7 meters high and covers the area of 686 square meters. The Hall for Viewing Opera is in the north of the Pavilion of Pleasant Sounds, and it has two floors. It was the place for the Royal family to watch performances. Opera at the Qing Court is the exhibition that is open all year round in this hall. After you finish your visit exit on the north gate (Gate of Divine Might), because just across is the entrance to the Jingshan Park. If you are too tired for visiting National Museum of China, you can skip it and relax in the Jingshan Park.